Inspired by DrugMonkeyBlog, I have gone through and listed the first ipscell.com blog posts of each of the 12 months of 2014. It makes for a surprising summary of the year. 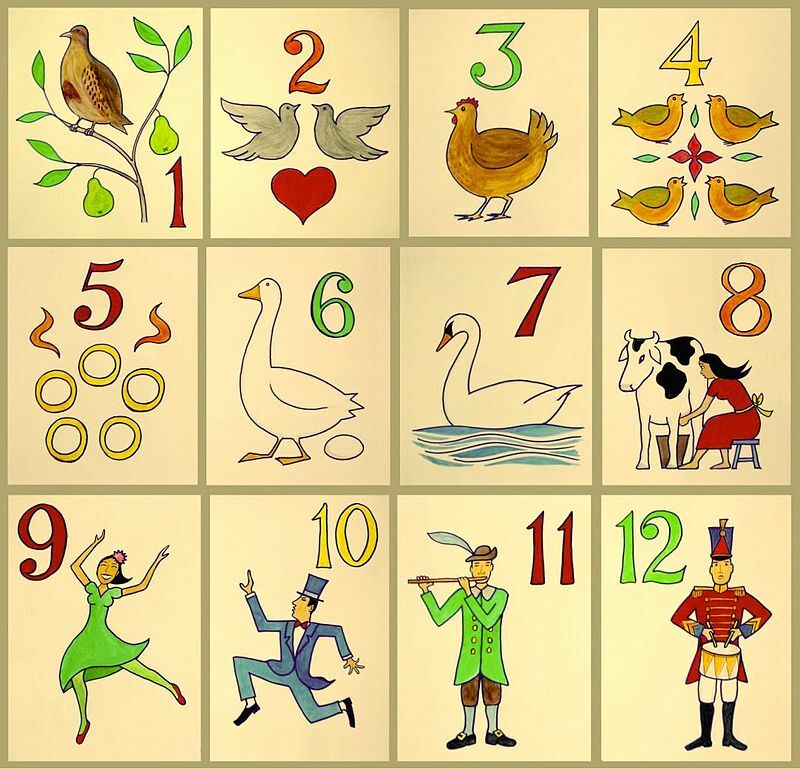 Think of it as the 12 months of stem cell blog mass (12 days of Christmas image from Wikipedia). Just for fun, I’ve included both the blog post title and the first sentence of each post. Jan: Stem Cell Outreach Success in Spanish: ¿Qué son las células madre? I’ve been working on a stem cell outreach program for education (SCOPE) the last couple years. Feb: Interview with Charles Vacanti on STAP Cells: Link to Spore Stem Cells & More. The recent publication of two Nature papers on acid treatment produced stem cells (so-called STAP stem cells) has been a blockbuster story in the stem cell field and has grabbed major global media attention as well. Mar: Latest STAP stem cell whispers: glimmers of hope or mirages? I’ve heard several reports now that labs can sometimes see some kind of either Oct4-GFP reporter activity or pluripotency gene expression in acid treated cells, but the scientists do not seem particularly encouraged. April: RIKEN Report Is Virtual Acid Bath of Criticism for Obokata: What’s Next? RIKEN Institute in Japan has formally announced the complete findings of its investigation into the STAP cell research and Nature papers. May: Welcome CIRM 2.0 and President Mills. The future is now. June: Human skin stolen from regen med firm? The AP reports that one Gary Dudek of Pennsylvania is facing criminal charges for allegedly stealing more than $350,000 worth of human skin from a Massachusetts regenerative medicine company that was his former employer. July: The Measures Size Up Stem Cells. Last week I visited NIST, the National Institute for Standards and Technologies in Gaithersburg, Maryland as a member of a review panel. Aug: STAP cell scandal image gallery. Want to go the links associated with specific images? Sep: Given a do-over, would you still go to grad school again? Take Our Polls. Science is a wonderful field to be in, but there are many challenges too and in some ways things have gotten more complicated and difficult. Oct: Home stretch on October deadline NIH grant & I’m…(fill in the blank). Grant deadlines are no picnic. Dec: New Interview with FDA on Key Stem Cell Regulatory Issues & Its Own Research. It’s been a seemingly rather quiet year on the regulatory front in the US when it comes to direct-to-consumer stem cell interventions even as the number of dubious stem cell clinics continues to skyrocket.